When in Nigeria, you are certain to do as the Nigerians do but that is an understatement for sure. You do not actually have to travel all the way to Africa in order o be acquainted with the best of this ancient and exciting country. The world has shrunk into a global village of late with almost all things Nigerian being delivered right to your doorstep. You will not lack for the unique condiments and spices along with a host of different kinds of flours either thanks to Olu Olu Foods. It is one of the staples in Nigeria and a number of African countries, commonly known as fufu. It resembles mashed potatoes but is actually heavier thereby making you feel fuller after a meal of yam that has been pounded with the aid of mortar. It constitutes a side dish and usually served alongside a traditional Nigerian soup such as egusi, the Ogbolo or edikaikong. How to buy pounded yam? You may be unable to get over the taste of pounded yam flour that enriches a number of dishes of Nigeria. Do not fret though! You can certainly get your money’s worth by checking the exotic food section in the super market or ask your friendly grocer to bring it to you. Do not leave your seat, if you are wary about having to go out in inclement weather. Go through online resources instead and simply order your supplies from the shores that specialize in Nigerian products. A dish of pounded yam is sure to make dinner an invigorating experience. Unfortunately, the stress of preparing it from scratch is likely to take its toll on you. Pounding the yam with the help of a mortar and pestle is laborious and can leave the basic ingredient grainy and lumpy, if you are unable to perfect the technique. Ditch the age old way therefore and check out how to minimize the time and labor while obtaining the right consistency without any trouble. Feel free to use the blender on boiled yam and convert it into a stretchy ball of dough within a short time. Crush the yam with the assistance of a hand mixer until it becomes smooth and soft. However, the best way to achieve amazing results would be to add hot water to a portion of Nigerian pounded yam flour and stir until it turns into an amazing ball of pounded yam. 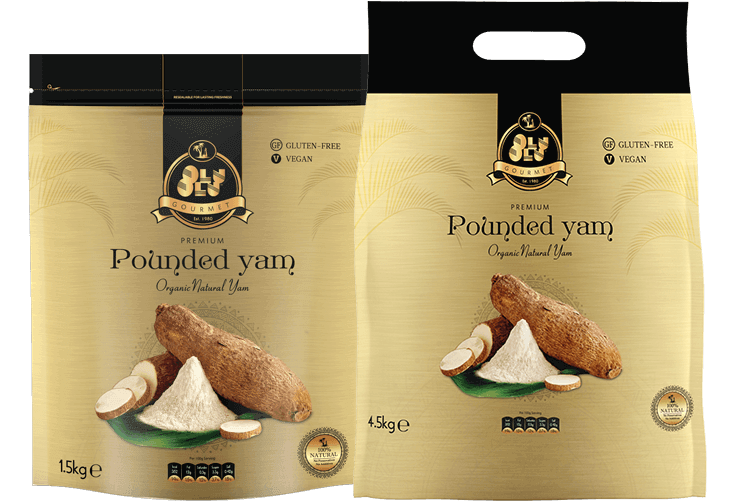 Be sure to buy pounded yam flour from Olu Olu Foods for tasting the best pounded yam delicacy.